The Growth Share Matrix is designed to bring in as much cash as possible. It helps the user decide on which business ventures will be of the most value, which should be considered, and which should be discarded. Opportunities that require analysis to decide whether or not they are worth pursuing. Opportunities that may be beneficial; they require a large investment but may involve high returns. Opportunities that are practically useless and should be refused; although they only require a small investment, they will generate a very small return. Opportunities that are extremely profitable and beneficial; they require only a small investment which generates high return rates. In a business, or practically any other enterprise, losing money could cause dangerous complications. Making shrewd, educated decisions before pursuing opportunities could help prevent an operation from failing. if the market currently requires a high or low investment to see good return results, which impacts cash consumption (Market Growth). These two factors play an important part in the success of a business/enterprise, and they are what make up the Growth Share Matrix. 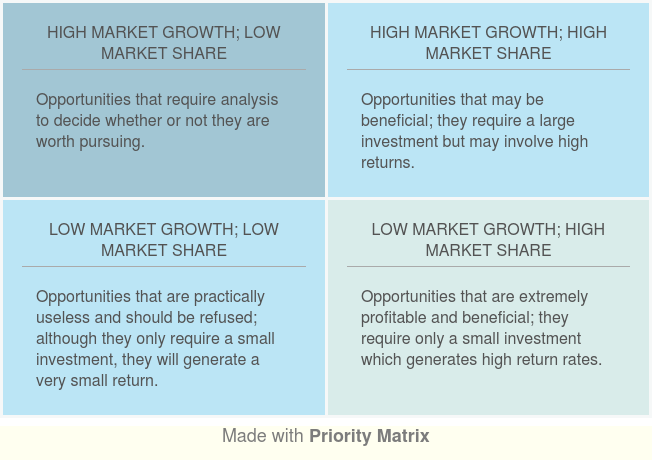 The growth share matrix basically splits opportunities into four quadrants: those that require low cash investment and involve low cash returns (Quadrant 1), those that require high cash investment and involve high cash returns (Quadrant 2), those that require low cash investment and involve low cash returns (Quadrant 3), and those that require low cash investment and involve high cash returns (Quadrant 4). Enjoy this template? Share it!